This guy is based off of Astorath in the pose. The painting is fairly Codex, but painting it taught me a few things. The first was about highlighting and shading. I'm continuing to work on my process of selective application if you will. A more complete explanation on the process can be found here. The whole thing comes from that one painting quiz I posted way back when where I was looking into how much detail is needed on a model to get the point across. The colors and process in this case are a refinement of the process I used to paint the Storm Wardens squad last year. The two big things outside of that were painting the double headed axe with lightning type effects and then making it look like his eyes are glowing. I've covered this technique before. 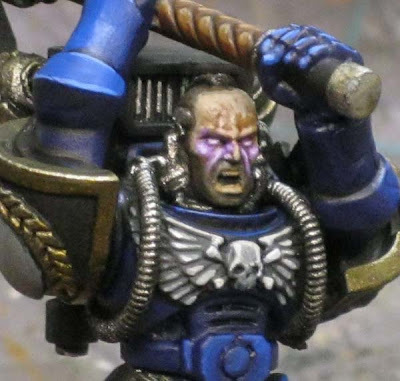 The idea is to pick the color of your "lightning" and then pair that up with a wash. A full discussion on the the Space Hulk approach to power weapons can be found in this post. Here I made the lightning purple to tie in with the theme of the army. I really used the purple on this guy as a spot color instead of a main color like it is on the rest of the force. This way, he's still tied in with the army, but is able to stand out wearing the classic Librarian blue. I went with two purples for the lightning in this case, a warm one and a cool purple (Vivid Violet by Americana and Lavender by Folk Art respectively). By taking a base color of P3 Beaten Purple and adding it to the side of the blade, I'm able to give it some life instead of just being black primer. Overall the blade will remain dark, but I was looking to add a little more emphasis to the sides. Adding the lightning to the blade. I started with the warm purple and added a series of squiggles that originated from under the wings. A quick wash of GW Leviathan Purple followed by repeating the process using the cool purple. Each pass I made, I brought my lightning out a little less. This made the finished lightning appear to be fading away the further it gets from it origination point. Getting just the right look. I keep repeating the lightning/wash method until I have the look I like. Sometimes you can get it in a couple passes, sometimes it takes a bunch. It all depends on how high of a contrast you want in the end too. I've done this once before, but it was on a bigger scale. Unfortunately, a quick search of the FTW Blog rolls did not turn anything up that I could use. So... I'll cover the process a little more in depth here for those looking to try it on their models. hand for sure. I use a Raphael 8404 Size 0 I pick up from Secret Weapon Minis. It's actually the brush I use for the majority of my painting. If you've never picked out all the tiny details on a face, you might want to do a test model or two before sitting down to try this on your prized character model. That being said, the last part is to make sure you do not obscure detail on the face as you paint. 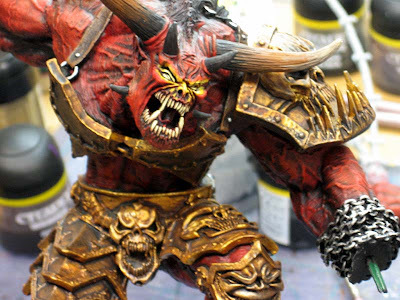 This means you need to prime carefully, basecoat carefully and as you paint, thin your paints so you don't build up paint and loose any detail. since I had a huge area to work in. For this guy, I really had to focus since my work area was considerably smaller. I started by painting his head the way I normally do. Prime black, basecoat skin color, a couple washes for the shadows followed up with some highlights over that to get the contrast. No exaggeration, I painted it how I would normally do it if I were NOT making his eyes glow. I went in and added his shaved head and some stubble for his beard too for good measure. With all of that done, it was time to try to make his eyes glow. Like I said, I'd never done this before and I don't see it done very often to be honest. I started by taking a light purple (Lavender by Folk Art)and going over his eyeballs and the surrounding area below his brow where the radiant light would be picked up. For a huge discussion on Object Source Lighting, check out this series of posts. I deliberately pushed the radius of the reflected light in order to draw attention to the fact that his eyes are glowing. While it may not be "correct," you've got to know when to bend the rules slightly for effect. This was followed by a wash of GW Leviathan Purple for the recessed areas. Then I repeated the first step again, but didn't come out as far as I did on the face as I did the first time. Follow that with another pass of the Leviathan Purple. Then I added a tiny bit of white to the Lavender and repeated the highlighting again... not going out as far. The final step was to add a bit more white to the purple and hit just the eyes and the immediate skin around them. Is it 100 percent accurate? Most likely not. I think it's a good representation and there's enough there to convince the viewer of what it is. And if I can convince the viewer, that's really what I'm trying to do. I have had another reader send me their attempt and we took a look at what he could do to improve the effect on his model. I was worried how this guy would turn out when I started. The glowing eyes thing and the fact that there is not much on him in terms of detail had me concerned. I actually like that he is clean and uncluttered. He has an "old school" feeling to him I think. I also used this guy to push my contrasts. He's got some real shadows on him and it gives him a very dark and sinister look overall. Makes him look very serious and more real than the other models in the force that are only painted to a tabletop standard. I'm glad the eyes came out as well as they did, I think it adds a huge amount to the model overall and really makes him unique. The only left for me to do is figure out a nice bit of freehand I can add to his right shoulderpad. Very nice job as always. Thanks for taking step-by-step for the Axe. Superb work here Ron. The force weapon and eyes are really well done. Highlights work exactly as you planned. It looks like a light is shining directly over him. Great work on the eyes also. Thanks for the step by steps and links back. He's superb. Those eyes really make the model that bit special. Thanks guys. I didn't realize how well the eyes would come across in the end. I think on the right model, it's definitely something I'll be using on my guys. 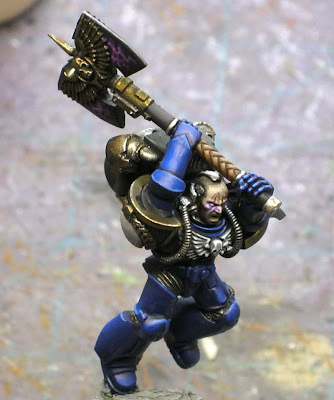 Impressive paintjob, I dig the cold tones of blue used as well as the lightning and OSL effects. Good job sir! Gotta love the power weapon, the eyes and the rust blending in the jetpack!! Mister Feral: The OSL is a bit forced, but I think it does the job of capturing the feel of it more than being accurate and that to me is what makes it work best. I really love the look of the eyes. I am highly tempted to get a model to try this out on. Great job! 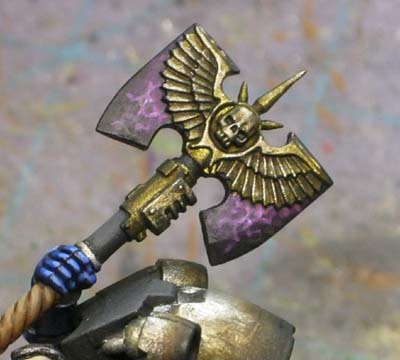 One bit that stands out for me is the axe handle - illustrated best in the last picture - lovely highlighting there, and really adds to the miniature, making the axe as a whole stand out, rather than just the blade (which is also great). If I had one minor criticism, it's that the OSL effect goes a little too far down the face, the cheekbones would have blocked those areas - but it's only a minor thing and still a fantastic looking effect. Wow! What an awesome looking mini. Thanks for the tutorial. Great stuff Ron and the tutorial on the axe is much appreciated. I've been struggling for a while on getting a purple power weapon effect right for my Grey Knight's, so the timing of this post couldn't be better. Purple just seems to be the right colour for the power weapons of psychic characters. The glow effect on the eyes manages to be both striking and subtle at the same time. This is definately something im goin to learn to do. Andy: You're right. The effect does go a bit further than it would in reality. That was a deliberate choice to push the effect since his head was somewhat covered by his arms. sendraks: Thanks. I like the purple, but I'm partial to a light blue-green color myself. Kirsten: Really? As if my name wasn't all over the site with how to get ahold of me. Better luck elsewhere with your gambling ads. Mephistopheles: Thanks. I'm still refining it myself, but I definitely like the finished look of the model and the feeling this kind of lighting gives. Great work, Ron. The OSL on the eyes is great. Just curious, what colors would you use to do the lightning effects in red? Yes, I got a message from Kirsten also -- Begone Spam-bot! Hudson: Thanks. As for red, I think I would use a Baal Red wash and a real bright red for the reflected light. I don't think I would add any white except to the actual eye itself. The trick is making the reflected light NOT look pink. The red lighting needs to affect the skin color and not create a new color on the face. With some colors, it's easier to do than others. I might try it at home one night to see how it comes out to see if my idea works.